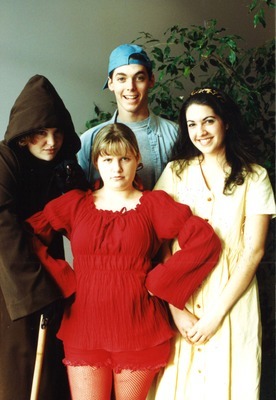 A promotional photograph of the University of Southern Maine production of Into the Woods. The USM School of Music and Theatre Department are collaborating to present the fractured fairy tale "Into the Woods". Performances run March 8-17. Pictured in this rehearsal photo are: (L to R, Front) The Witch (Kelly Caufield of Gorham), Little Red Riding Hood (Stephanie Gallo of Fallsburg, NY) and Cinderella (Rachel Garfield of Standish). (Back) Jack played by Daniel Gaouette of Houlton.